ABBOTT MOTORS, An exceptional car buying Experience, is offering this exceptional Labrador Black 2015 Mitsubishi Outlander GT AWD for sale. ABBOTT MOTORS has over 50 years of automotive experience! We are also a CARFAX Advantage Dealer. We offer great deals and specialize in FINANCING FOR EVERYONE-ALL CREDIT APPS ACCEPTED! We look forward to helping you purchase your next vehicle. CALL or TEXT (716) 229-5711 for quick answers to your questions about this vehicle. Your message will be answered by a real human never an automated system This Mitsubishi includes: ACCESSORY ROOF RACK CROSS BARS (PIO) Luggage Rack TOWING PACKAGE Tow Hitch ACCESSORY ALLOY FUEL DOOR (PIO) This 2015 Mitsubishi Outlander comes with a CARFAX Buyback Guarantee, which means you can buy with certainty. 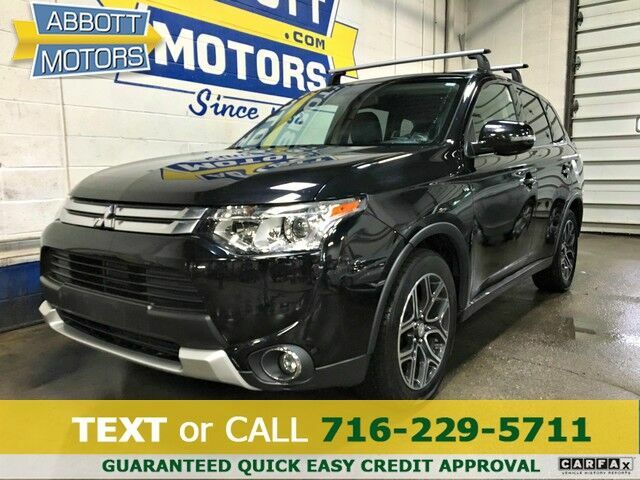 Enjoy an extra level of calm when purchasing this Mitsubishi Outlander GT 4WD, it's a CARFAX One-Owner. The CARFAX report shows everything you need to know to confidently make your pre-owned purchase. This SUV is a superb example of what a tough, work focused vehicle should be. Exceptional towing, acceleration and torque will help you get the job done. This vehicle comes with 4WD for better traction on unstable surfaces, like snow and dirt to give you the edge over anything you might encounter on the road. Looking for a Mitsubishi Outlander that is in great condition inside and out? Take a look at this beauty. The 2015 Mitsubishi Outlander is built with pure muscle. Punch the throttle and feel the power of its torque and horsepower plant you firmly to the back of the seat. This highly refined Mitsubishi Outlander comes with exciting features you'd expect in a vehicle twice the price. The tires on this exceptional vehicle have minimal wear and look to be nearly new. This Mitsubishi Outlander GT 4WD has a flawless finish that complements its wonderful interior. This rare vehicle is a prime example of automotive engineering perfected. We are proud to offer this 2015 Mitsubishi that truly a "must-have." This vehicle's wheels are one of the many attractive features that this Outlander GT 4WD has to offer. More information about the 2015 Mitsubishi Outlander: The Outlander is in a crowded field, up against best-sellers such as the Honda CR-V, Toyota RAV4, Ford Escape and the Subaru Forester. Against these, the Outlander offers a comparable exterior but manages to pack seating for more people inside. Interior space and fuel efficiency are both big strengths. Mitsubishi also says that the Outlander is one of the most fuel-efficient utility vehicles offered in the North American market with standard 7-passenger seating (it's rated up to 31 mpg highway). The Outlander can tow up to 3,500 pounds, which should be plenty for a small boat or a couple of jet skis. Ground clearance for the Outlander is 8.5 inches, which should give it an easier time with snow than some other crossovers. Strengths of this model include active-safety options, good 4-cylinder fuel economy, smooth ride, Seating space for up to seven, and all-weather capability STOP IN TODAY or Apply Online 24/7 at Abbottmotors.com ... All Trade-ins Welcome... Same Day Delivery... Call or Text Today and See The Difference... We Look Forward to Serving You! !This vehicle may be subject to potential open recall(s). Vehicle recall information may be found at Safecar.gov. Please verify price, equipment, options and features with your sales rep before your purchase. We Look Forward to Serving You. *Tax, title, plates extra. All Financing On Approved Credit. BBB accredited A+ member.